If you watched The Social Network, the movie about the founding of Facebook, you may remember that they were adamantly against posting advertising on the platform, along with Google and a few other of the sites that launched Internet 2.0. It’s one of the indisputable facts that the film didn’t need to fictionalize. Of course, almost all of them have now admitted that ceasing to exist justifies the potential for doing evil by allowing sponsored content. But in keeping with their establishing principles, these sites also highly regulate that content, more than even the law requires, and none can be more stringent or fickle than Facebook. 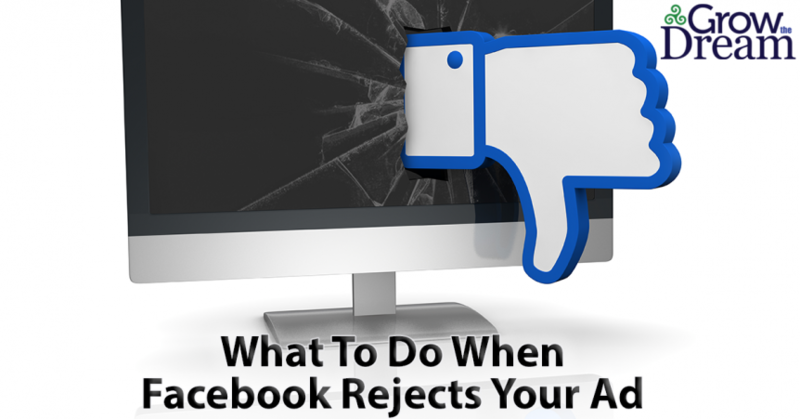 Business owners large and small feel the sting of rejected Facebook ads every day. Some are offered justification, while others get kicked for seemingly random, extremely arbitrary reasons – if those reasons are even fully articulated. Which can get frustrating – but you already know that. That’s why you clicked on an article titled “Why Facebook Rejected Your Ad,” right? In doing my research on the social media giant, I found one site that listed over 100 reasons why Facebook might reject your ad. While I appreciate their attention to detail, I have to imagine looking at a list that long and detailed has got to be disheartening. Especially if you’re a small business owner without huge budget or hours of free time to keep re-submitting your ads. So instead of a massive checklist of do’s and don’ts for Facebook ads, I’m going to break it down to the essentials. If you follow these guidelines, I can’t guarantee your ad won’t be rejected, but you’ll significantly reduce the likelihood of it happening. And you’ll be able to articulate better when you appeal the rejection. We’ll start with the stuff that should be obvious. Don’t try and sell anything illegal. If you can’t or shouldn’t advertise it in the real world, don’t try it in the virtual one either. That includes things like Marijuana that’s legal in some states and not others. Sorry, it won’t fly. By the same token, what you’re selling must be an actual real thing. Your ad can’t infringe on anyone else’s copyright. Sorry, no rings from those summer & winter games, or that iconic rodent from California and his friends. This also covers lotteries – only the authorized lottery sponsor – the state – can promote their chance of fortune. Nothing too controversial. While Facebook has taken some flack for fiddling with your news feed, on the advertising side, they don’t want your ads exploiting political or social issues for your gain. No profanities, racial slurs, or symbols. That includes being clever like the old Beetle Bailey comic strips, and substituting hashtags, punctuation or emojis to try and sneak profanity in. Facebook also requires proper grammar and punctuation. There are certain ads that no matter what you do, Facebook will always reject them. If your ad promotes tobacco or any drugs and/or drug-related products – legal or not – it’s going to be marked return to sender. Facebook doesn’t care if it’s a schedule 2 narcotic or OTC Benadryl, you can’t advertise it on Facebook. And yes, that includes vaping. Don’t bother trying to sell weapons, ammunition, or explosives either. Just like in school, these items are verboten in Facebook ads. That includes excessively violent content, cool spy gadgets like spy cams, surveillance equipment, phone trackers, spyware, and, of course, computer malware. In the same vein, anything that smacks of black market or dark web stuff, including fake ID’s, passports, college degrees and immigration papers are also off-limits. Any and all adult content is also a no-no. And, either being cynical or realistic, Facebook classifies most Online Dating as adult content as well. A few squeeze through, but trust me, they’re spending significantly more dollars to make it happen than most small businesses can afford. Don’t try to advertise your product that “legally” grabs and streams pirated content online. You may justify it in your own home all you want, but Facebook agrees with the FCC that even the devices themselves are illegal since they access illegally obtained content. Facebook’s also wary of diet ads. Any type of Before and After images, as well as “sketchy” diet supplements or weight loss programs are almost universally rejected. Health products and more traditional weight loss approaches are sometimes approved, but must be specifically targeted for users over the age of 18. Whether you call them ‘business opportunities’ or not, or come up with another more innocuous label, Facebook doesn’t tolerate ads from any type of Multi-Level Marketing structured system. Feel free to argue with them, but you’ll lose. Additionally, Facebook will not approve ads for payday or cash advance services and any type of fee-for-bidding, aka penny auctions. If you discovered it on late night cable TV, it’s probably not something Facebook condones. Finally, if you’re selling or promoting alcohol, it must be strictly targeted to follow the laws and restrictions of the countries you’re offering it to. For example, in the United States, the drinking age is 21, so you must aim above that. Also, Facebook has significant restrictions on the images you may use in alcohol ads and what they imply. If you intend to create any such ads, I’d check out Facebook’s specific policies first. A note on the wording: while Facebook gives advertisers access to target very specific incomes, races, ages, sexual orientations, religions and political views, among other things, they will reject your ad if you imply that you have access to said data. Facebook insiders refer to this as the “Never An Other” rule – If your headline or copy uses a phrase that connects your personal, private characteristics with an OTHER like you, it’ll get sent back to the drawing board. Back when Facebook first started allowing ads, they believed that visuals would work better on their site. The less text, the less intrusive and the more it looked like just any other part of the Facebook platform. In keeping with that theory, they developed their now famous (to people like us) 20% Rule. The 20% rule stated that no more than 20% of your ad could contain text, including logos that consisted of text (like our own). Supposedly Facebook has now done away with the 20% rule, but it probably safer to stick with it. That forces you to be more creative in your headlines, too – 4 words being the most popular length, and restricting the subsequent copy to 15 more words. With very few exceptions, the more text your ad displays, the less likely it is to be approved. If you want to evaluate your ad even before you submit for approval, Facebook has a tool for that. There’s a little phrase hidden in Facebook’s extensive ad policy that might trip you up if you miss it: “The destination URL must function properly in all browsers.” That means you can’t just check your Landing Page in Google Chrome or Firefox, you also have to make sure it works in Microsoft Edge, Safari, and on mobile devices. We’ll get more into Landing Pages in a moment, but this is a hiccup that can easily be checked, but is often neglected, leading to the red X. It bears repeating that you should spell and style check your copy as well. Again, grammar and punctuation errors can lead to rejection. One of the main reasons a large group of Facebook ads get rejected is due to one or more error on the Landing Page that ad is linked to – and some of it contradicts the online marketing lessons of just 10 years ago. First, your Landing Page cannot offer any of the prohibited items that the ad couldn’t feature either. Nice try, but the rules are the same. You don’t have to use the same image on the Landing Page as you did the ad, but you’ve got a higher chance of being approved if you do. Same with your headline and copy. The more consistent the Landing Page is with the ad that sends you there, the more Facebook likes it. We’re not talking about the oddly popular Funko toys, here, but the online marketing ‘secret’ people like us at Grow the Dream and others have promoted for years. Facebook will reject your ad if it links to a Landing Page that has Pop-Up, Pop-Overs, Pop-Unders, aka “Before You Go,” or any such cleverly orchestrated device that tries to prevent the user from leaving the page once they’ve arrived. Your Landing Page, while it should be specific to your target customer and offer, should also be connected to the rest of your site. If users can’t get to the home, about or contact me pages, the Landing Page and ad will probably get booted. Leave that to the fake and spoof news sites. Facebook doesn’t like controversial or fear-inducing language in your ad or your Landing Page. Similarly, your Landing Page can’t actually be selling or offering something completely different. Misleading, fraudulent or deceptive claims will send you back to square one. The ad has to link to an actual Landing Page. If Facebook gets Page Not Found, or Under Construction, it’s an automatic rejection. Which, honestly you want to happen. The whole point is to get them to your page. If you mistyped the URL or don’t have things ready to go, it’s better to fix it now. Not only must your Landing Page be directly reflective of your ad, if your page has an Opt-in, Facebook may will follow that trail to ensure that THAT offer is also consistent with the ad. One easy fix – just give them what you promise on the Landing Page. Your ad says they’ll get ABC, they get ABC, right there as soon as they click. Then drop a second added bonus to the end that requires an Opt-in. Offer them an even better, more valuable Lead Magnet to trade for their email and you’ve achieved the same effect. And if it’s a laser-targeted Lead Magnet, you’ve further qualified the prospect. Or required software to access content. Yes, this includes Adobe Flash. But considering THEY hardly support it anymore, it’s probably time to upgrade to HTML 5 or WebGL, etc. Seriously. Automatic rejection, with cause and may get you banned. Of course, if you were unaware your site was infected, clean it now and do what you can to ensure the protection of data. Then resubmit. This also includes cloaking your site or using their click through to gather data unaware. Anything that would get it flagged by Web of Trust (I highly recommend their browser add-on for all Internet users). Building really good looking, responsive Landing Pages that work across all platforms and browsers can be a daunting task, especially if you’ve never coded a page before. There are lots of tools out there you could try, but I’ll give you a shortcut. The ones we’ve found to be most effective, and integrate both with your site and deliver what Facebook is looking for are Optimize Press, running inside WordPress, and Infusionsoft. Both have their advantages, and both can be integrated seamlessly into your existing website and boast tools to help you both automate and track your customers as they come in. Stay on Target; Stay on Target! One of the reasons Facebook ads are so valuable is because they can be so specifically targeted. One Reddit user became Internet famous a few years back for driving his roommate insane by so specifically targeting him with the Facebook ad algorithm. While we don’t advocate such practices for your business, you should definitely take advantage of the tools at your disposal. If we’ve said it once, we’ve said it a thousand times (actually, I should probably count, it might be higher than that now), the key to successful marketing – online or otherwise – is identifying and targeting your ideal customer. Marketing solutions are great, but strategic marketing solutions will take the cake every time. When you’ve done the strategic work, it’s easy to apply it to Facebook’s ad targeting, and in fact, with Facebook you can drill down deeper than anywhere else (unless your ideal target customer isn’t a Facebook user). Just last year, the Washington Post illuminated 98 specific data points that Facebook gathers from anyone who will permit them. Bet you’re thinking about double checking those privacy settings right about now, aren’t you? I should point out that while the data is available, the persons represented by the data is a closely-held secret within Facebook. Neither you nor any other ad buyer will see who the data points represent – which is the main reason for the “Never An Other” ad copy rule. If your ad is initially rejected, and you legitimately believe that it is within the guidelines, dispute and request a review. Because the ad approval process is a joint operation between algorithm and human, mistakes sometimes happen and you deserve a second look. Don’t abuse the process or you may find yourself banned, but you won’t be flagged for a few disputes. Another source of ad disapproval is inaccurate targeting: geographic, age, or placement. You can always edit your campaign, ad sets and targeted audience to see if that resolves the problem. When you’re starting the ad approval process, start early. East Coasters have an advantage. Generally, Facebook ad reviews happen quicker Monday – Friday, 5am to 5pm EST. And the earlier the better. Depending on your business, adding a disclaimer to your ad and your landing page that ‘not everyone may get the same results’ may significantly speed up your ad review process. In the end, Facebook reserves the right to reject, approve or remove any ad for any reason, at their sole discretion. It’s their sandbox and they get to set the rules and decide when to enforce them. But if you follow the above tips, you’ll find yourself in the approved pile more often than not.